Home » Hayu Marca | “The Gate of the Gods” ⊗ Stargate of Ancient Aliens? 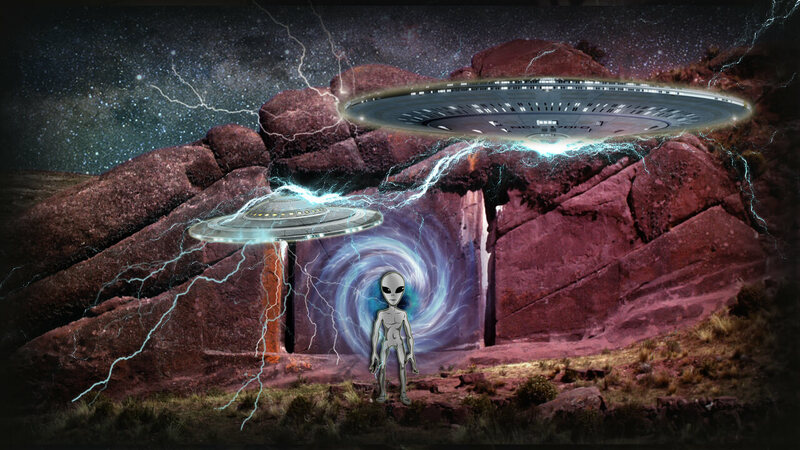 Hayu Marca | “The Gate of the Gods” ⊗ Stargate of Ancient Aliens? Visitors from all corners of the world remain confused by seeing a giant gate carved into the solid rock that seems to be a place of access, but it does not go anywhere! Some people who touched it felt an energy that passed through their bodies, they had strange experiences, stars, columns of fire, and heard the sounds of an unusually rhythmic music. Examining the “Gate of the Gods,” archaeologists have discovered in the centre a small circular cavity in which a gold disc is supposed to be inserted. An ancient legend says that near Lake Titicaca there is a gate through which the gods come and go on Earth. This door is forbidden yet, but one day it will reopen and the creator gods will return on board the sun ships. Then a new era will begin, and people will turn and worship their masters. At first glance, this legend is one, without much consistency. As we know, any legend has a kernel of truth, be it big or small. In this way, the mysterious gate exists and was discovered by chance, by a guide, Jose Luis Delgado Mamani, who explored the mountainous region of Hayu Brand, 35 km from the city of Puno in Peru. But why should a rock door be created that does not go anywhere? Is there a way to get around here? The ancient Peruvian legends tell that America was once united under one ruler and under a common spiritual tradition. The name “America” comes from “Ameri-ca”, “Ameru”, which means “Land of the Snake,” named after the historically well-known character Aramu Muru or Amaru (Snake/wisdom). Aramu Muru came from the ancient Mu continent (Lemuria). He has brought many technological objects, including the powerful “solar disc”. According to the peoples of Peru, at that time, following the destruction of the continents of Mu and Atlantis, the great king-priest would have helped many primitive tribes upon his arrival. Thus, with its help, the ancient tribes were able to build impressive megalithic temples, still visible in the Mesoamerican regions. According to the legend, this first king-priest crossed the portal due to a special object that activated the opening, turning the stone into a stargate, and this special object was the “golden disc” that Aramu Muru had with him. He crossed the Stargate and no one ever saw him. A shaman was the witness of the whole event, told the various tribes in the region, and so it was transmitted for many generations. Archaeologists who have examined the “Gate of the Gods” of Hayu Marca have discovered a small circular depression in the centre, suggesting that the gold disk would be embedded in this place. According to Philip Coppens, author, and investigative journalist, “it seems like a science fiction story. It is said that the device was made of gold and various other precious stones. We are all inclined to believe that it is just a coincidence or fantasy. It is possible for a pile of truth to hide behind these legends: this gold disc may have had a connection with some ancient extraterrestrial civilizations and it was a device that made it possible to travel between different worlds. This means taking a person, taking it to another place or another dimension, and bringing it back. According to local legends, these kings-priests, known as the “Brothers in the Space”, seemed to come from other worlds. Is it possible that they have reached the earth through the Gate of the Gods (Hayu Marca)? But is there really a device able to activate this gate? And if so, where did the passage lead? According to the “ancient astronauts” theory, the gods’ gates are at the end of a space-time tunnel (wormhole), a kind of portal that connects it to another part of the universe or another dimension. “The Gate of the Gods” ⊗ Stargate of Ancient Aliens? The gravitational tunnel is a theoretical construct based on the theory of general relativity. There is indeed the possibility that space and time are connected and that different parts of space and time are connected through a tunnel. If this structure were to be created, a shortcut would be obtained between the parts of the universe far from each other. Gravitational tunnels are therefore an accepted element of theoretical physics, and the idea that there are stargates comes from ancient times. More and more often we find artefacts or representations with people passing through strange passages or forms of energy. People of antiquity did not understand technology, just as we try to understand the possibility of gravity tunnels. And if the “Puerta de Hayu Marca” was at the end of one of these “Stargates” used by “the ancient astronauts” to reach our planet? Is that why Peru is considered one of the UFO’s intense activities on Earth? There are often strange luminous phenomena in Lake Titicaca area and many witnesses claim to have seen UFOs come out. Locals always speak of giant light spheres of light or bright discs. There have even been reports of extraterrestrial beings described as tall, pale, totally different from the South American local population, which has dark skin and hair. Other legends tell of a gateway to the land of gods through which, in ancient times, the gods have descended from heaven and created life on the earth, and great heroes who have gone through this gate and have gone to join the gods for a glorious life of immortality.